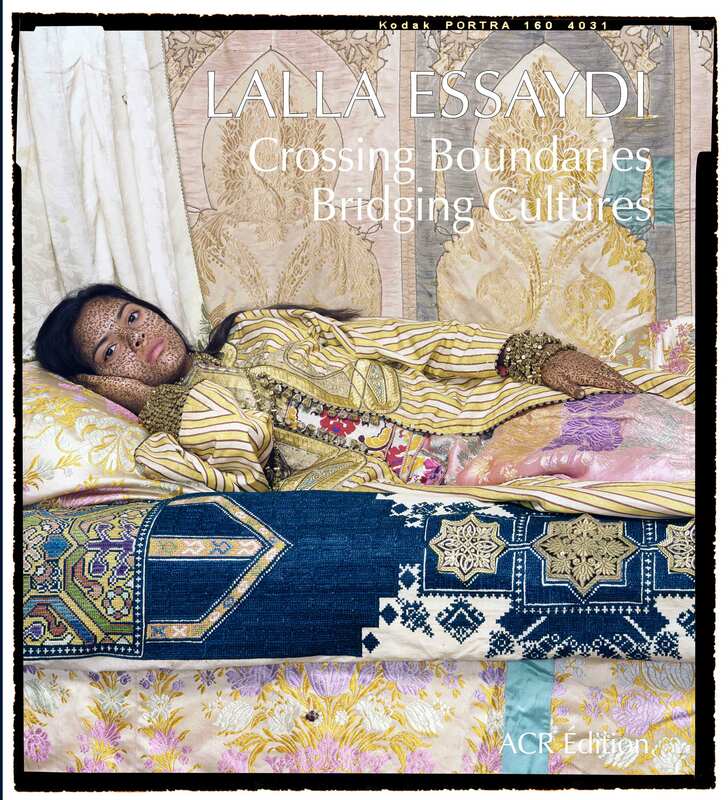 Crossing boundaries and expanding ideas of physical and social space are not new challenges for Essaydi, as her lived experience spans divergent, locations, cultures, and ideologies. Moroccan born and raised, Essaydi became an artist after relocating from Morocco to Saudi Arabia, then France, and ultimately to the United States. This itinerant personal history has afforded her the distance and means to explore the varied dimensions of Muslim women’s experiences based on those of her own, and also to challenge the boundaries that shaped her upbringing. She believes her work, with its very intimate portrayal of Moroccan women and the private spaces they inhabit, would not have been possible without distance from her homeland. Well-educated, well-traveled, and raised in a closely knit family of means, Essaydi (b.1956) enjoyed a privileged and enriching childhood in Marrakesh, Morocco, in a traditional Muslim household that included relatively private spaces reserved for women. Within these spaces, women led animated lives among extended family and friends. She has spent much of her life in the Muslim world where women were expected to maintain traditional gender roles as daughters, sisters, and ultimately as wives and mothers. She followed this path for many years, first as a daughter in Morocco, and later as wife and mother in Saudi Arabia, where she raised her family. In 1990 Essaydi broke from the conventions of her upbringing as she embarked upon an independent path in her personal and professional lives. She began a career as an artist when, as an adult, she moved to France to attend the École des Beaux-Arts (1992-1994) where she studied painting. She then attended art schools in the United States, earning a Bachelor of Fine Arts from Tufts University (1999) and a Master of Fine Arts from the School of the Museum of Fine Arts, Boston, and Tufts University (2003). During the course of these continuing art studies, in the 1990s she began working with photography, her current medium of choice. Now based in New York and her hometown, Marrakech, she also returns regularly to Saudi Arabia where she lived for many years. Her art, which often combines Islamic calligraphy with representations of the female form, addresses the complex reality of Arab female identity from the unique perspective of personal experience. In much of her work, she returns to her Moroccan girlhood, looking back on it as an adult woman caught somewhere between past and present, and as an artist, exploring the language in which to “speak” from this uncertain space. Her work often appropriate Orientalist imagery from the Western painting tradition, thereby inviting viewers to reconsider the Orientalist mythology. She has worked in numerous media, including painting, video, film, installation, and analog photography.